Long-term monitoring programs for measurement of atmospheric mercury concentrations are presently recognized as powerful tools for local, regional and global studies of atmospheric long-range transport processes, and they could also provide valuable information about the impact of emission controls on the global budget of atmospheric mercury, their observance and an insight into the global mercury cycle. China is believed to be an increasing atmospheric mercury emission source. However, only a few measurements of mercury, to our knowledge, have been done in ambient air over China. 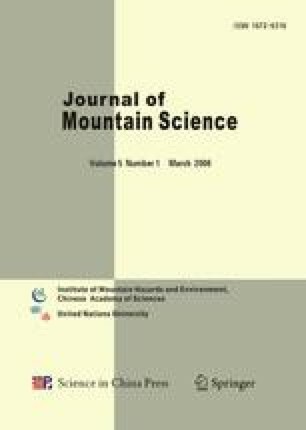 The highly-time resolved atmospheric mercury concentrations have been measured at Moxi Base Station (102°72′ 29°92′N, 1640 m asl) of the Gongga Alp Ecosystem Observation and Experiment Station of Chinese Academy of Sciences (CAS) from May 2005 to June 2006 by using a set of Automatic Atmospheric Mercury Speciation Analyzers (Tekran 2537A). Measurements were carried out with a time resolution of every 15 minutes. The overall average total gaseous mercury (TGM) covering the measurement periods was 4±1.38 ng·m−3 (N=57310), which is higher than the global background level of approximately 1.5∼2.0 ng·m−3. The measurements in all seasons showed a similar diurnal change pattern with a high concentration during daytime relative to nighttime and maximum concentration near solar noon and minimum concentration immediately before sunrise. The presence of diurnal TGM peaks during spring and summer was found earlier than that during autumn and winter. When divided seasonally, it was found that the concentrations of TGM were highest in winter with 6.13 ± 1.78 ng·m−3 and lowest in summer with 3.17 ± 0.67 ng·m−3. There were no significant differences in TGM among wind sectors during each season. Whereas Hg generally exhibited significant correlations with the parameters, such as temperature, saturated vapor pressure, precipitation, ultraviolet radiation (UV) and atmospheric pressure at the whole measurement stage, and the correlations varied seasonally. Our results suggest that the local or regional abundant geothermal activities, such as thermal spring, anthropogenic source processes and changes in meteorological conditions, regulate and affect Hg behavior in the study area.